a) No requirements of land which is a major issue in land-constrained countries such as India, Singapore etc. 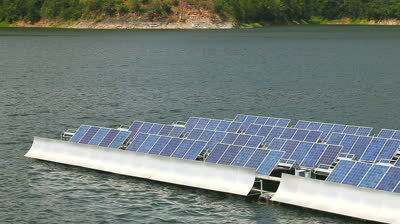 d) The sharp fall in the costs of floating solar has made it competitive with other forms of power sources. Thailand has set a target to set up more than 2.5 GW of floating solar farms over the next 15-20 years using the reservoirs of existing hydro dams which can potentially meet almost 10% of the country’s power generation requirements by 2037. What is different about Thailand’s plan is the fact that its target for floating solar is higher than that for ground mounted utility solar projects. Though floating solar is gaining traction, the total installed capacity of floating solar has hardly touched 1 GW as compared to the total installed capacity of more than 350 GW of solar around the world. The floating solar plants or “floatovolataics” are getting more popular in India owing to land paucity, but they involve a higher maintenance and installation cost. However, they are regarded as a better alternative to land because they can be built on industrial water bodies like wastewater treatment plants, cooling facilities in factories and power plants etc. You might also want to Take A Look At These Floating Solar Homes!